Nowruz (meaning New Day) is the name of the Iranian/Persian New Year. It marks as the first day of spring and the begining of the year in the Iranian Calender. To celebrate this auspicious day, here I have compiled down some of the best Nowruz quotes, wishes, greetings and messages. 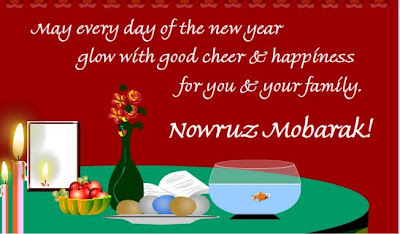 Just hope you like this Nowruz wishes and quote compilation and share some of them. May everyday of the new year glow with new cheer and happiness for you and your family. Nowruz Moobarak! Let's make our Nowruz celebration a happier one by spending it together. Wish you a more than ever Happy Nowruz! Hope this Nowruz brings lots of LOVE and WARMTH for you and your loved ones...Do not hate anyone as we have got the LIFE to LOVE and NOT to HATE others. Happy Nowruz! May the coming year take you on the path to glory where all your endeavors become glorious and your life becomes a success story. Happy Nowruz! Wishing you an year that marks the beginning of remarkable era of success and happiness in your life. Happy Noruz 1392!